After winning a special election in U.S. House District 27, Republican Michael Cloud officially became Texas' newest member of Congress on Tuesday. But he's not done campaigning yet — to keep the seat, he'll need to win it again in November. 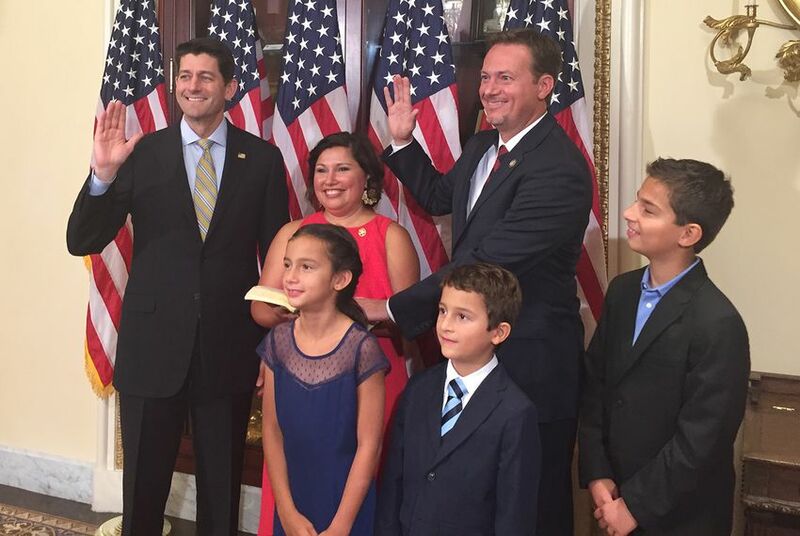 WASHINGTON, D.C. — With an oath on the U.S. House floor to uphold the Constitution — and with friends and family watching from above — Republican Michael Cloud officially became the newest member of Texas' congressional delegation Tuesday evening. The swearing-in ceremony took place just before Cloud cast his first vote as the representative for Texas' 27th Congressional District, which stretches along the Gulf Coast and up toward Austin. After being introduced by U.S. Rep. Joe Barton, R-Ennis, Cloud took to the podium with his three children to address the chamber. "I pray that we have the courage and the strength to do what's right and to serve the people of this nation well," he said to his new colleagues. Cloud assumed the seat after winning a special election last month to finish out the term of former Republican U.S. Rep. Blake Farenthold, who resigned in April after revelations that he used $84,000 in taxpayer dollars to settle a sexual harassment claim. Cloud beat Democratic candidate Eric Holguin for the seat, 55 percent to 32 percent, surpassing the 50 percent threshold he needed to avoid a runoff. Seven other candidates also ran, though none received more than 5 percent of the vote. Cloud, who formerly chaired the Victoria County GOP, arrived in Washington on Sunday and quickly got to work assembling a staff and learning the ropes on Capitol Hill. Now that he has been sworn in, he can move into Farenthold's former office, and he will find out his committee assignments this week. Cloud is also opening district offices in Victoria and Corpus Christi. Cloud will face another election — and Holguin, his Democratic opponent — in November, this time to determine who will win a full two-year term in Congress. Libertarian Daniel Tinus and independent James Duerr are also on the ballot.